"I just want this to feel like a regular vacation! And somewhere in there I'll just slide into 50." Netflix has debuted an official trailer for the comedy Wine Country, the feature directorial debut of comedian Amy Poehler. The ensemble comedy is about a big group of longtime girlfriends who head out to Napa for the weekend to celebrate their friend's 50th birthday, and while there tensions from the past to boil over. Think Bridesmaids, but heading to Napa for some wine fun instead of a bachelorette party. The full cast includes Rachel Dratch, Ana Gasteyer, Amy Poehler, Maya Rudolph, Paula Pell, Emily Spivey, Cherry Jones, and Maya Erskine, with Jason Schwartzman, and Tina Fey. This looks like a wild and raucous and amusing film with one hell of a cast, and they're exactly what will make it so memorable. Pop the cork! In honor of Rebecca's (Rachel Dratch) 50th birthday, Abby (Amy Poehler) plans a scenic Napa getaway with their best, longtime friends including: workaholic Catherine (Ana Gasteyer), post-op Val (Paula Pell), homebody Jenny (Emily Spivey), and weary mom Naomi (Maya Rudolph) are equally sold on the chance to relax and reconnect. Yet as the alcohol flows, real world uncertainties intrude on the punchlines and gossip, and the women begin questioning their friendships and futures. 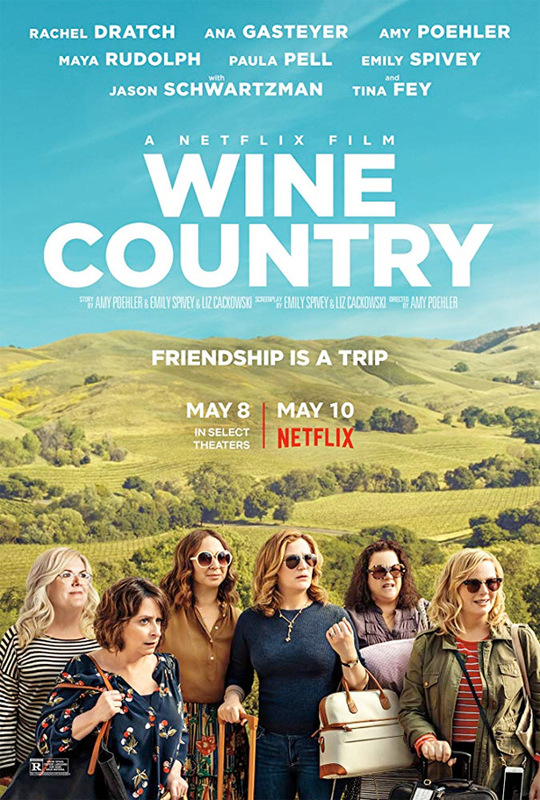 Wine Country is directed by actress / comedian Amy Poehler, making her feature directorial debut after directing a few episodes of "Parks & Rec" previously. The screenplay is written by Liz Cackowski and Emily Spivey. Netflix will release Poehler's Wine Country streaming exclusively starting May 10th at the beginning of next month. Who's up for this?